Of all the flying insects with stingers, the hornet is the most feared. They are the largest, and have the biggest and most painful stinger. The most common kind of hornet in the UK is the European hornet, which grows up to around 4cm in length, considerably larger than the average wasp. But whether you have a problem with hornets, wasps or bees, the pest control experts from PestControl.co.uk will be able to get rid of them quickly and safely. Since hornets are, to put it simply, a large variety of wasp, the main identifying factor is going to be size. You can also look at the colour though, the European hornet is dark brown and yellow, rather than the black and yellow of a wasp. Also, hornets tend to be louder in flight than wasps. There is some good news when it comes to dealing with hornets over wasps though. Even though most people are more scared of hornets than wasps due to the difference in size, it has been seen in experiments that hornets are actually less aggressive than wasps. They are less likely to attack you. By no means do we suggest you test this out of course, it's best to give them as wide a berth as possible, but it's useful to remember. And certainly you should make sure you stay away from the nest. 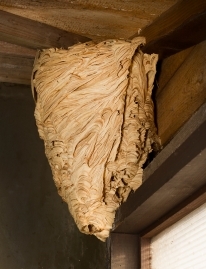 It's important to locate the general area of the hornets' nest before you call in the pest control technicians from PestControl.co.uk to get rid of it. The reason being that if you are unable to at least to ascertain that it is on your property then we may not be able to do anything about it. If it is on a neighbour's property, we will of course need their permission to access the nest. If you have a number of hornets in your house or garden, then there is going to be a nest nearby. They are going to want the nest to have some protection, so there are a number of places they may go such as the roof, under a tree, in a shed, etc. It is not necessary to actually visually locate the nest however, and you certainly should not get too close to it since that is one situation when hornets are likely to attack. To locate the general area of a hornets' nest, all you need to do is find the location that the hornets are gaining access to it. This might be in a gap between tiles on a roof, a hole in your shed, or a number of other places. The best way to find it is by watching a hornet which is returning to the area, as they are sure to go back to the nest quite quickly. You will know it is the nest because there will be a lot of activity there.